A newborn baby girl is noticed to have a small eroded lesion on the scalp (Figure). She was born by normal vaginal delivery and is otherwise healthy. Conditions to consider in the differential diagnosis of a scalp lesion on a newborn baby include the following. Trauma from scalp electrode monitor. A scalp electrode, which is commonly placed on the scalp of a fetus during labour as a continuous fetal heart rate monitor, often requires penetration of the skin to some level. Trauma can occur during the placement or removal of the electrode, with accidental skin detachment leaving an open wound. Secondary infection can occur, especially if the probe introduces bacteria through the wound. This would be very unlikely to produce a large or deep lesion. Neonatal herpes. This is an important diagnosis to consider, but the timing of the lesion makes it unlikely in this case. Neonatal herpes is acquired during vaginal delivery if the mother is shedding herpes simplex virus at the time, and usually arises several days to weeks after birth because it has an incubation period of four to 20 days. Cutaneous lesions present with erosions and vesicles that are superficial and crust rapidly; a skin vesicle swab for viral PCR will diagnose the condition. The risk to a neonate with cutaneous herpes simplex infection is disseminated infection with CNS and multiple organ involvement, which can lead to serious sequelae. Conjunctivitis and keratitis are less common, but eye examination is important. Children with neonatal herpes require a lumbar puncture for viral culture and treatment with intravenous aciclovir, and a paediatrician should be involved in management. Even when there is apparently only skin involvement, preventive treatment should be given. Aplasia cutis congenita. This condition (also known as congenital absence of skin) is the correct diagnosis. There are numerous forms, with nonsyndromic aplasia cutis of the scalp (as seen here) being the most common. 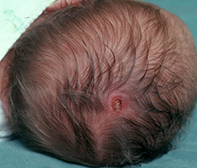 It most frequently affects the vertex parietal hair whorl because this is where the scalp is under most tension during the period of rapid hemispheric brain tissue growth in gestation.1 The lesion is characterised by ulceration, which may be superficial or deep, and it is usually small but can be extensive (larger lesions can erode down to bone or even into the dura). A small lesion tends to affect only the epidermis and a small part of the dermis and will heal well. However, all lesions form a scarred area that does not grow hair and can be complicated by hypertrophic scarring and persistent scaling in childhood. This is a clinical diagnosis and isolated aplasia cutis does not usually warrant further investigation other than a bacterial and viral skin swab, which is required to rule out neonatal herpes and superinfection. However, a lesion that is surrounded by a zone of hypertrichosis (‘hair collar sign’) or has a bullous appearance may be difficult to differentiate from a meningocoele, in which neural tissue is found outside the cranium and where there may be a connection to the dura. Imaging should always be performed in such cases. If the lesion is bullous and fluid-containing then there should never be an attempt to drain the lesion because it may connect with the cerebrospinal fluid. The exact cause of aplasia cutis congenita is unknown – most cases are spontaneous but there is thought to be some association with teratogens and premature rupture of membranes. Rarely, aplasia cutis is associated with other congenital defects, such as cleft lip and palate and limb reduction defects (Adams–Oliver syndrome). There are also associations with chromosomal disorders, epidermal naevi of the scalp, development anomalies and fetus papyraceus. If a child appears dysmorphic or has an extensive scalp lesion or a nonscalp lesion, further imaging should be performed and a geneticist involved in management. If the lesion appears to be deep, potentially involving bone, imaging should be performed. For a small lesion of aplasia cutis, such as in this case, no specific treatment is required. However, it is important that the wound be kept clean while it heals. All lesions will leave a scar, but the vast majority become less obvious with growth and do not require surgical intervention. Large lesions may require skin and or bone grafting or other methods of cosmetic repair to remove scar tissue when the child is older. 1. Stephan MJ, Smith DW, Ponzi JW, Alden ER. Origin of scalp vertex aplasia cutis. J Pediatr 1982; 101: 850-853.